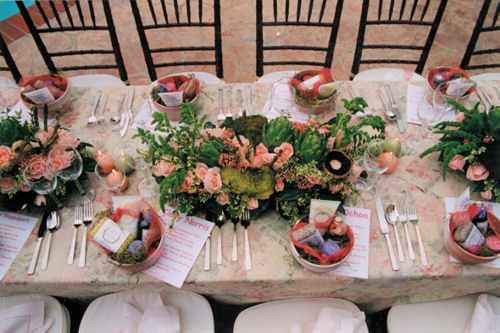 If the outdoors isn’t an option on your special day, there are plenty of ways you can transform a dining room or venue into a whimsical secret garden. By incorporating fresh cut centerpieces, pastel table linens and baby inspired place settings, you can make any room feel magical. Create fun, individual arrangements for guests to take home at the end of the party by combining flowers, reusable glasses and cute playful accessories. The milkshakes below can be recreated with carnations, peonies, mums or cabbage roses, along with straws, colorful red and pink string, and matching bows. Don’t be overwhelmed by all of the pink – there are lots of options for little boys too!